International students bring cultural, social, and economic benefits to our campus and vibrant diversity to our communities. Vantage College is UBC’s innovative first-year program for international students who are academically outstanding and have English as a second language. Vantage College draws from countries and school systems around the world, stimulating a deep exchange of thoughts, ideas, and discussion. International students are attracted to UBC by its world-renowned educational opportunity, diversity on campus and the chance to meet people from around the globe. Vantage College has a mandate to develop UBC’s understanding of ways to support students with English as a second language, for the benefit of all our students. It is a living laboratory of scholarly teaching, using leading pedagogical, administrative and ethnological approaches to better understand how international students learn. Vantage College’s innovative pedagogy, academic English programming, and administrative process are already attracting attention and interest from universities around the world. Vantage College is entirely self-funded by student tuition. UBC Vantage College is the only international college of its kind at a top-tier university in Canada. The program is taught by UBC faculty, courses are full UBC courses approved by Senate. Our students are UBC students who receive an undifferentiated transcript. Vantage One offers a full 11-month first year program in Arts and Science, and in 2015 introduced Engineering and Management. Vantage College students will progress to both UBC campuses. Some will spend their third term at the Okanagan Campus, and these students will visit the UBC Okanagan campus during their first year. Moving into its fifth year, the college has more than 350 students. The program was approved by UBC Vancouver Senate in March of 2013 with UBC Board of Governors approving the tuition program fee and capital plan in June of 2013. UBC’s student union, the AMS, was actively involved in the planning and development of UBC Vantage College since the outset. Vantage creates opportunities for both international and domestic students. International students do not displace domestic students at UBC. The Vantage College classrooms and offices are housed in the beautiful Orchard Commons building (opened in 2016), which also includes one of UBC’s newer residences for first-year students, and the popular Open Kitchen. Vantage College academic spaces take up approximately 20% of the Orchard Commons building. Some Vantage College students live in the Orchard Commons residence while others live in Totem Park or Place Vanier. Orchard Commons adds more than 1,000 beds for first-year students at UBC. All first year UBC students, domestic and international, are guaranteed on-campus housing. Approximately half the students living in Orchard Commons are international students and half are domestic students. In 2017, approximately 10% of the students living in Orchard Commons are in the Vantage One programs (first year Vantage College programming). The remainder of Vantage students reside with other domestic and international first-year students at Totem Park and Place Vanier residences. This arrangement allows Vantage students to learn from and integrate with the wider student body. The cost of construction is funded entirely by a Board of Governor’s approved loan from UBC’s endowment, and will be repaid with interest. Vantage College will repay its 20% share of the debt, with interest. Student Housing and Hospitality Services will repay the remaining 80% from housing and meal fees. Vantage One students take first year UBC courses with embedded academic English and perform well as they transition into the second year of their UBC degree programs. The Vantage One program currently has students from over 28 countries around the world, including Brazil, China, Ecuador, Egypt, Indonesia, Iran, Japan, Korea, Mongolia, Taiwan, Turkey, and Vietnam. UBC Vantage College only accepts applicants who are academically strong and meet UBC’s competitive (not minimum) academic admission requirements. This year the college refused admission to hundreds of applicants. UBC Vantage College has a financial aid program for international students who do not have sufficient financial means, ensuring the college is able to attract students from diverse economic backgrounds. In 2017/18, 7% of Vantage student tuition (about $1,000,000) will fund scholarships for almost 50 students. Roundhouse Radio, Sense of Place with Minelle Mahtani (July 20, 2016). Minelle speaks with UBC's Dr. Joanne Fox and student, Felipe Solano, along with creativity columnist Jon Winebrenner about the new UBC Vantage Capstone Conference. Listen here. Learn more about the research presented by Vantage students at the UBC Capstone Conference here. Hear from our students about their international student experience at UBC so far. 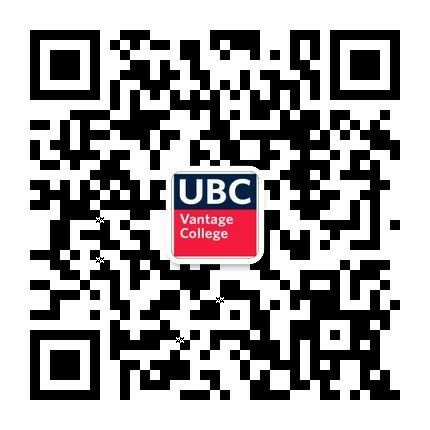 UBC online feature highlighting the student benefits of Vantage College.